By request...the best Peanut Butter Chocolate Chip Cookies EV-ER. Few can deny that peanut butter and chocolate are a blissfully delicious match. In fact, they just may be dynamic duo of a baking world. This recipe is simple yet brilliant as when these iconic flavors are combined and baked, the result is simply irresistible. The peanut butter cookie recipe was inherited from my sweet Grannie who never bought a bakery item in her life. She made everything from scratch but always welcomed an eager grandchild to assist her in the kitchen. I can recall the smell of her baked goods engulfing her small home and practically luring us there for frequent visits. Fast forward to my grown-up kitchen where there are many a shortcut made except when it comes to cookies. My boys were raised to pass on store boxed cookies and often initiated that we bake together. 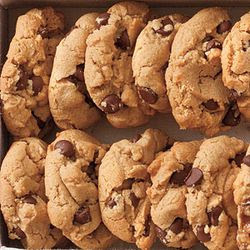 One day, we strayed from the recipe and tossed in chocolate chips and a new twist on a classic cookie became our family tradition. It doesn't have to be complicated to be divinely delicious. But be warned, this recipe is highly addictive. WINE PAIRING : These irresistible cookies go so well with Spokane blissful blends. How do I know this? Research. Lots of research. Warning: These cookies are highly addictive. • Preheat oven to 375ºF. • Place sheets of foil on countertop for cooling cookies or use a cooling rack. • Combine peanut butter, shortening, light brown sugar, milk and vanilla in large bowl. • Beat at medium speed of electric mixer until well blended. • Add egg. Beat just until blended. • Combine flour, salt and baking soda. • Add to creamed mixture at low speed. Mix just until blended. • Drop by heaping teaspoonfuls 2 inches apart onto ungreased baking sheet. • Flatten slightly in crisscross pattern with tines of fork. • Bake at 375ºF for 7 to 8 minutes or until set and just beginning to brown.